The train is the most used way in Japan to travel from one city to another, especially between the three large urban areas of Tokyo, Nagoya and Osaka-Kyoto, all served by fast shinkansen trains. Even for short distances the train is the most widespread means of transport, with capillary networks of local trains. 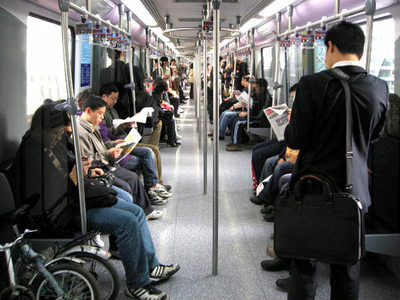 The Japanese rail transport system is by far the best in the world in terms of efficiency, punctuality and cleanliness. Trains are always on time to the second, except for exceptional events such as earthquakes, very adverse weather conditions or suicides. The trains are spotlessly clean and inside the level of politeness and respect of local passengers is almost inconceivable for many foreigners. The main railway company in the country is JR (Japan Railways), a railway group that operates in all regions from north to south through several sub-groups. Beyond the different names, in practice nothing changes for passengers and the network is unique across the country. You can also use the several prepaid cards for public transportation indiscriminately throughout Japan. JR operates numerous local and regional routes in the various areas of the country, and has the monopoly of high-speed trains, called shinkansen in Japanese. In addition to the JR company, in Japan there are also a myriad of smaller railway companies that operate only in certain regions and generally own few lines. Except in some cases, usually different railway companies operate in different stations. If in the same area there are two railway lines of two different companies (sometimes it happens in large metropolitan areas, especially in Tokyo), it is very likely that in that area there are two different stations each used by a different company. 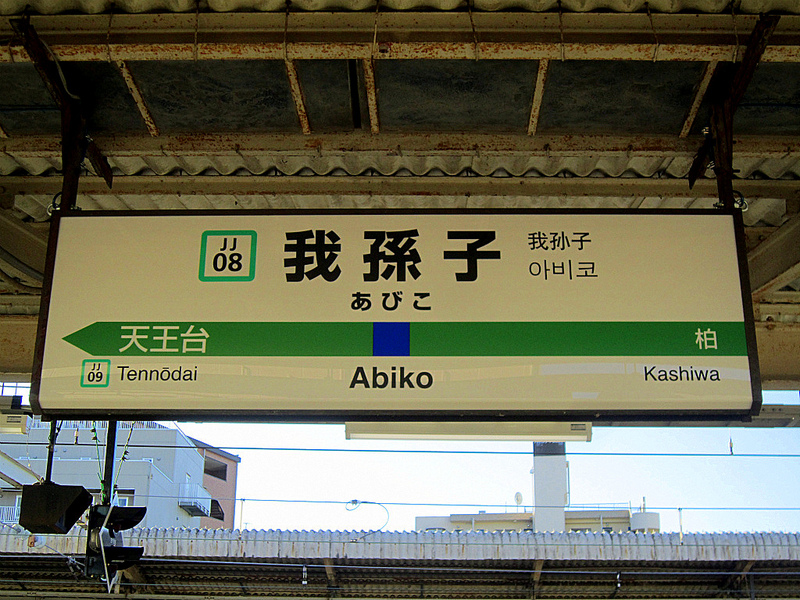 Local (普通, futsū), trains that make all the stops along the line up to the indicated train terminus; seats are not reserved. Rapid (快速, kaisoku), trains that make some stops less than local trains; seats are not reserved. 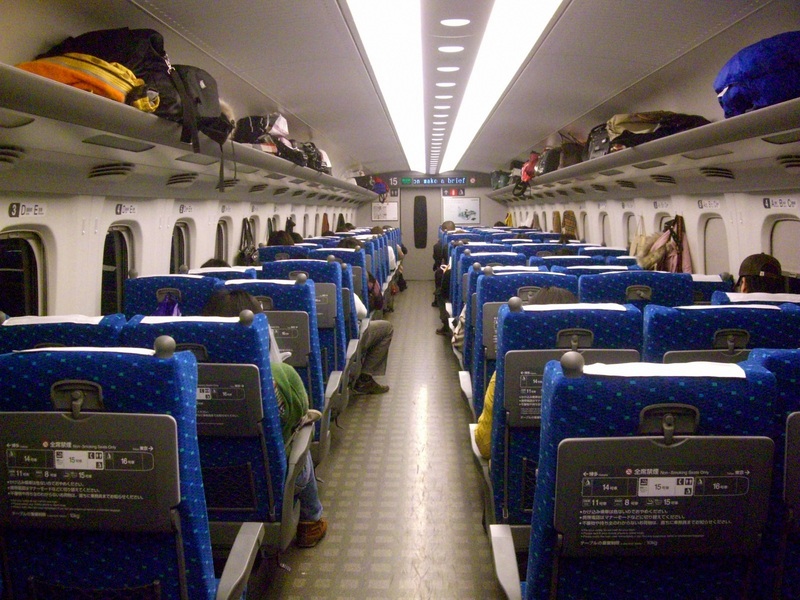 Express (急行, kyuko), trains that make even less stops than local or rapid trains; seats are not reserved. Limited-express (特急, tokkyu), these trains are faster than the previous categories, you can find them especially on routes that connect different prefectures but that are not served by shinkansen lines; seats are reserved. Shinkansen (新幹線, shinkansen), high-speed trains that run on separate tracks (normal lines use different tracks), often traveling over 300 km/h; The shinkansen network connects the most important cities of the country from north to south. Sleeper (寝台列車,shindai ressha), night trains with sleepers. They were very common in the past, but today only two trains are still operating: the Sunrise-Izumu (Tokyo-Osaka-Okayama-Izumo) and the Sunrise Seto (Tokyo-Osaka-Okayama-Takamatsu). 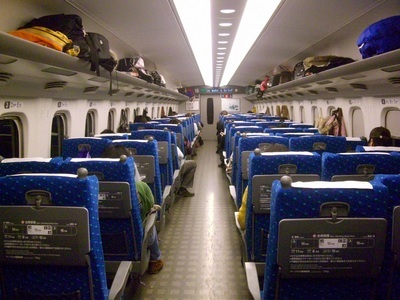 Usually, long-distance trains are shinkansen or limited-express, the remaining categories are active only on urban or intra-regional lines and no seat reservation is required. Gran class (グランクラス gurankurasu), luxurious class introduced a few years ago and only on some lines, similar to the business class on airplanes. Only 18 seats in a coach. The seats are widely reclining, you will be given some accessories (eye mask, slippers, blanket) and a menu from which you can order unlimited drinks and food. Some have reserved seats only, others have cars with reserved seats and cars with non-reserved seats. In some cases, they also have a green car. 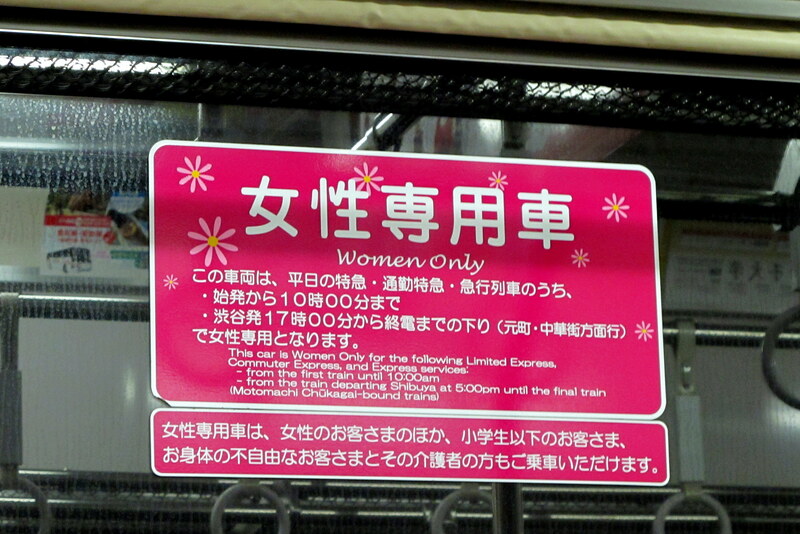 Generally all other trains have only non-reserved. 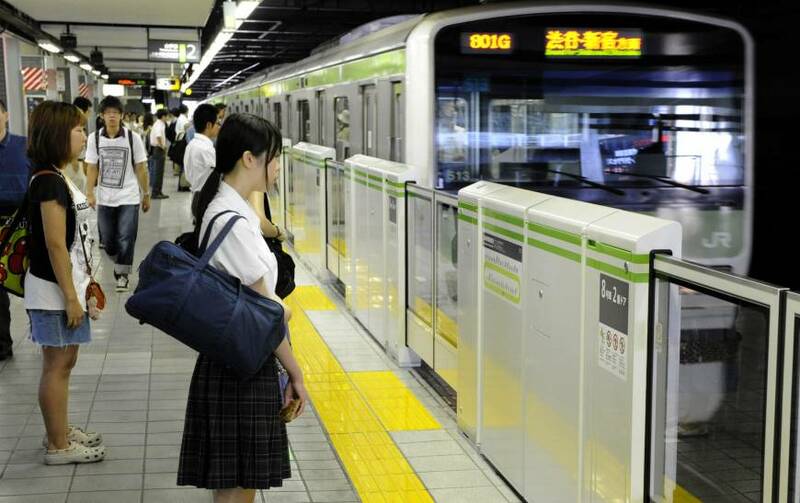 For some lines, especially in the Tokyo area, there may be some "Green Car" cars for which you need to purchase an extra ticket. How much do trains in Japan cost? Trains in Japan are generally very expensive, whatever their type. In particular, shinkansen high-speed trains are incredibly expensive, so much so that even the plane is often cheaper if booked in advance. 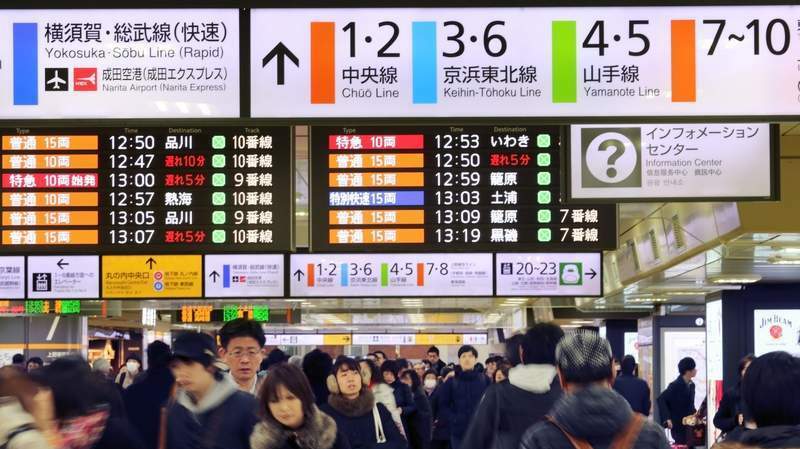 Fortunately, however, only for foreign tourists (who are not resident in Japan) it is possible to buy special passes that allow you to use many trains without limit for a certain period of time, at very convenient prices. The most famous pass used by the majority of tourists traveling to Japan is the Japan Rail Pass. If you have a prepaid card (suica, pasmo, icoca, ecc. ), no ticket is required. Just keep the card loaded with enough money and go directly to the turnstiles (entrance gates). Once at the destination, you will pass the card again to the exit turnstiles and the amount for the route traveled will be taken from your card. It is recommended to make one of these cards immediately upon arrival at the airport because they are useful and make you save a lot of time. More information on prepaid cards for public transport. You can buy tickets using automatic vending machines, generally also in English. 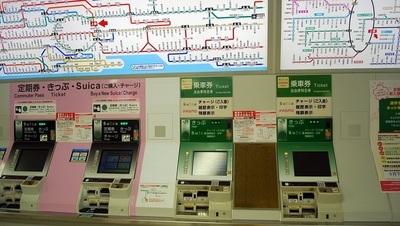 Usually in the automatic machines you do not have to select the destination station, but the ticket price you want to buy. In order to buy the correct ticket you must therefore know the cost of the route you intend to travel. Above the machines you can usually find a map of the entire railway network of that company. 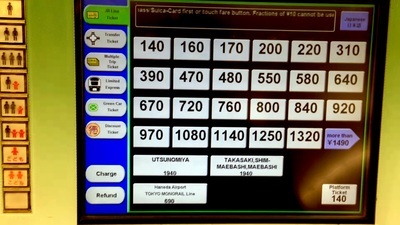 Below each station you will find a number indicating the cost to reach that station from the station where you are. Sometimes these maps are only in Japanese so it may be difficult to find the station where you are headed on the map. In this case you must first purchase the ticket through automatic machines (different and separate from the machines to buy tickets for local trains) or in a ticket office. In many stations the staff working at ticket offices does not speak excellent English, try to speak slowly and clearly or even better to write essential information on a sheet: number of tickets, date, departure and arrival stations, seat type. 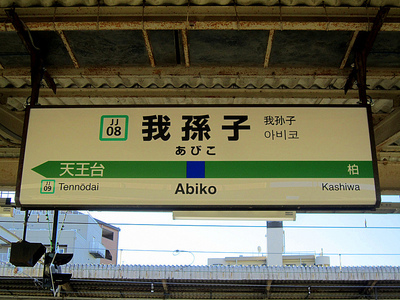 For trains in the Kanto (Tokyo), Tohoku and Hokkaido regions, an online reservation system is available. After booking online, you will still have to go to one of the pick-up points to get your paper ticket. 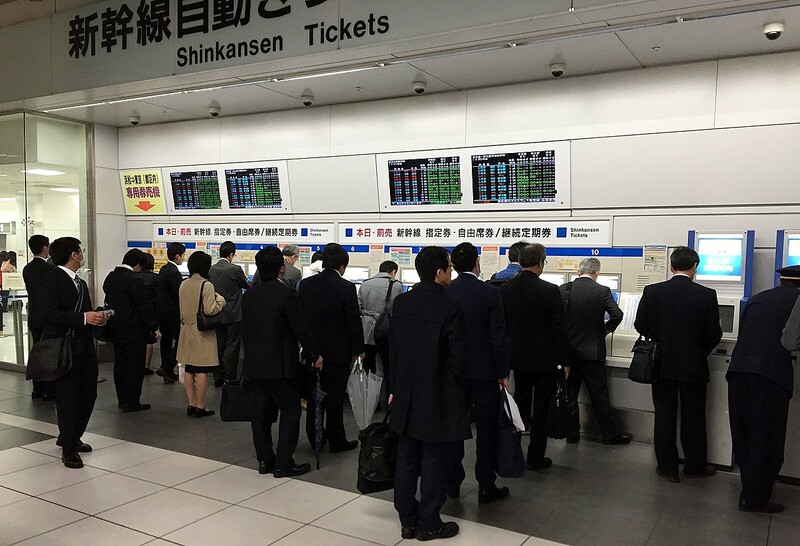 Only for shinkansen along the line between Tokyo and Fukuoka (passing through Nagoya, Kyoto, Osaka, Kobe, Hiroshima, etc) a new booking system is available via app. 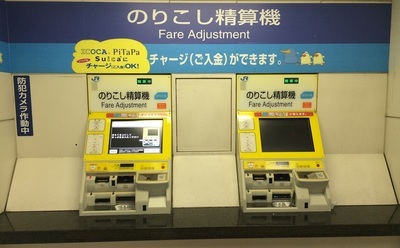 After booking, you will still have to go to special automatic machines to pick up your paper ticket. 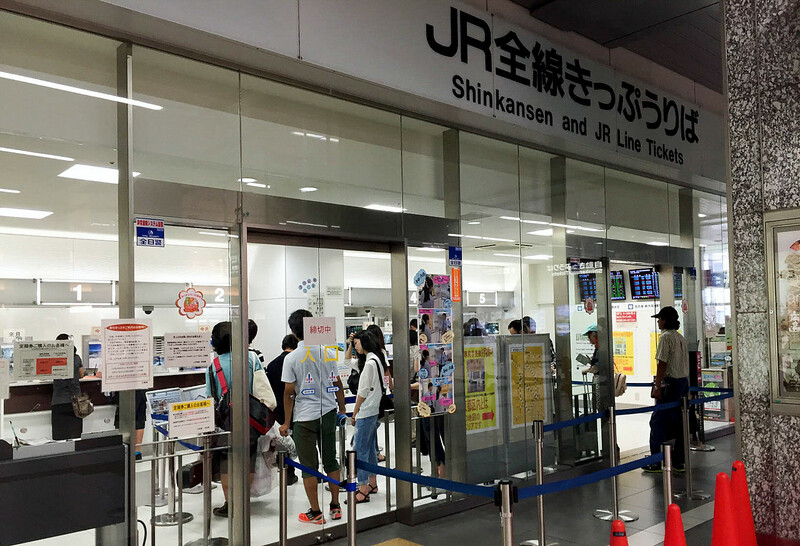 If it is a JR line without a required seat reservation, you can go directly to the turnstiles, showing your pass to the staff who will then let you pass. If you want to reserve a seat you can do it for free but you will have to go to a ticket office. Finally, please note that the Japan Rail Pass is valid only on JR lines. For any other company, you will have to buy the ticket normally. More information on the Japan Rail Pass. 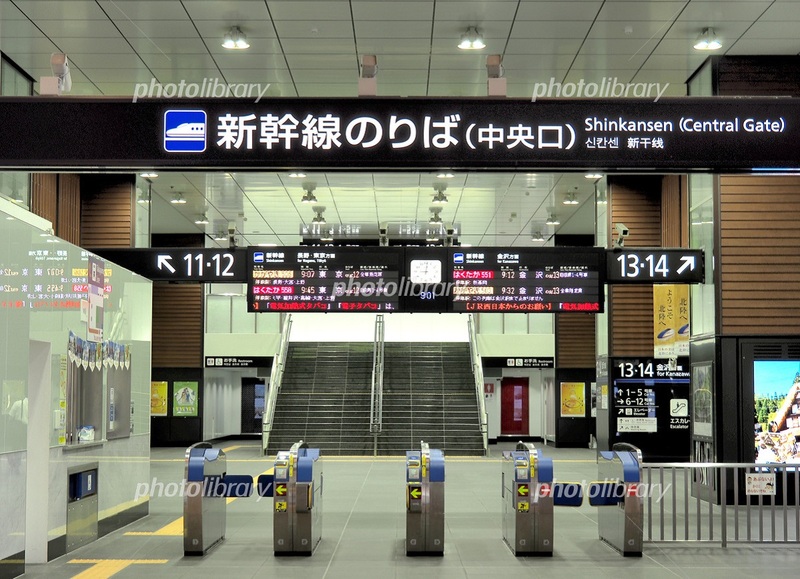 In Japan there are no ticket inspectors on local trains, only on shinkansen. To make sure that a traveler has the appropriate ticket there are turnstiles both to enter and to exit the train departure area, generally as in the photo below (there may not be turnstiles only in some remote countryside stations). If you use a prepaid card, just pass the prepaid card next to the card reader both when you enter and you exit the station, and the amount for the route you have traveled will be deducted from your prepaid card balance. If you have a paper ticket, you must insert it in the slot and get it back before going through the turnstiles. Do not throw the ticket away because it will be necessary once arrived at destination (see point 7). In all stations there is generally always a staffer of the railway company near the turnstiles. If you try to go through the turnstiles with a prepaid card with no money or with an invalid ticket or with no ticket, a sound will be emitted, the turnstile will close and you will draw the attention of the staff. Except in some remote countryside stations, it's very hard to be a fare-dodger (avoid paying for transportation like jumping the turnstile, etc). In Japan, usually every line/destination has its own specific platform. So it is not so important to check the departure track of a specific train, just follow the directions for the line/destination you are going to take. 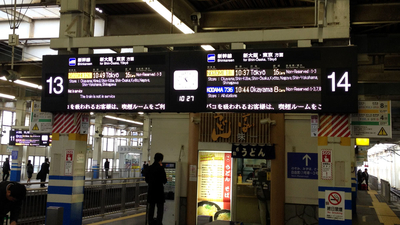 On the platform of each track you will then find screens that indicate the next trains departing from that platform. 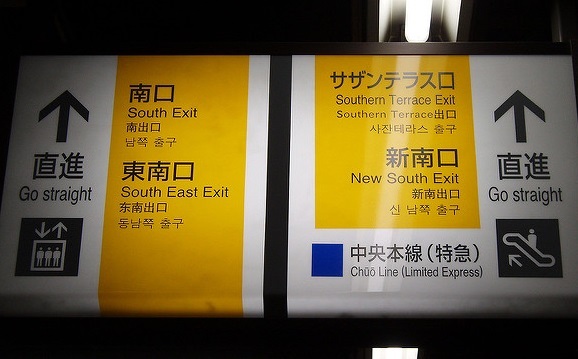 In many stations information is displayed in both Japanese and English. But it's not always like that. You can however easily guess if it is the right one by looking at the departure time or the train number, always written in Arabic numbers. 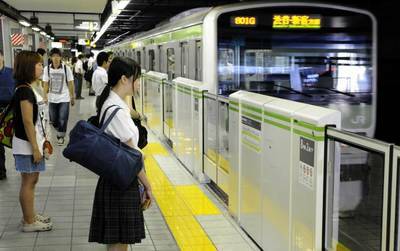 In Japan, trains stop in a very precise way along the platform. In many stations, you will find signs on the floor that indicate where exactly the doors will open once the train arrives. 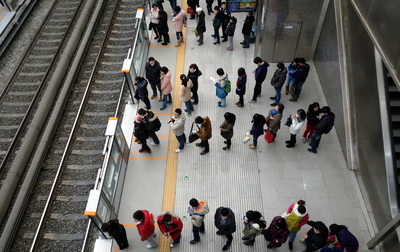 The Japanese are used to queue in a very orderly way behind the marked points. If you have to take a reserved seat, and then you also have a specific coach number, you will also find the numbers of the different coaches along the platform. 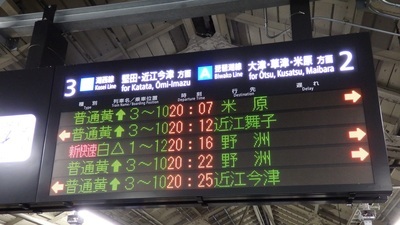 Since different kinds of train could stop along the same platform during the day, it may happen that the doors of different trains open at slightly different points or that the coaches numbers are different. 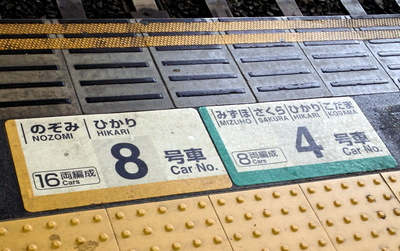 As you can see in the example in the picture above, in that case there are two different marks on the floor, one in yellow for the Nozomi and Hikari trains (in that case that will be the point to get on the coach number 8) and the other in green for the Mizuho, Sakura, Hikari and Kodama trains (in that case that will be the point for the coach number 4). 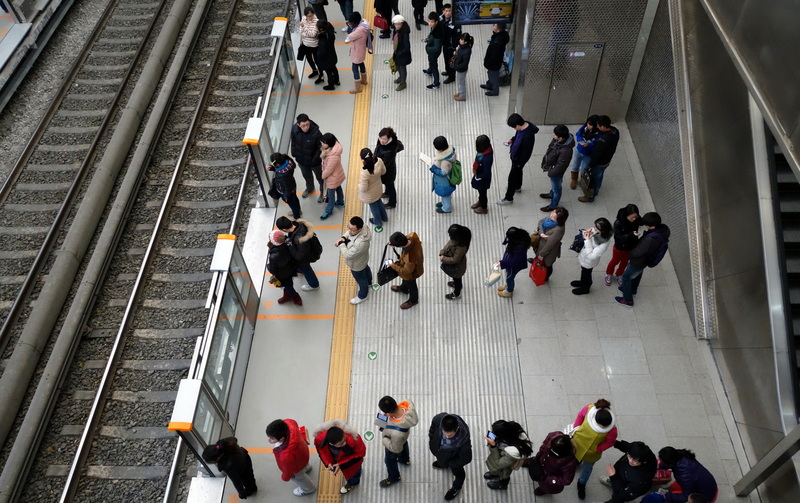 In large cities, some very crowded local railway lines may have women-only cars during rush-hours. 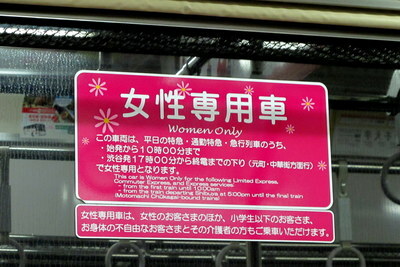 If you are men be careful not to make mistakes (you will always find the notice in English too, "Women Only"). 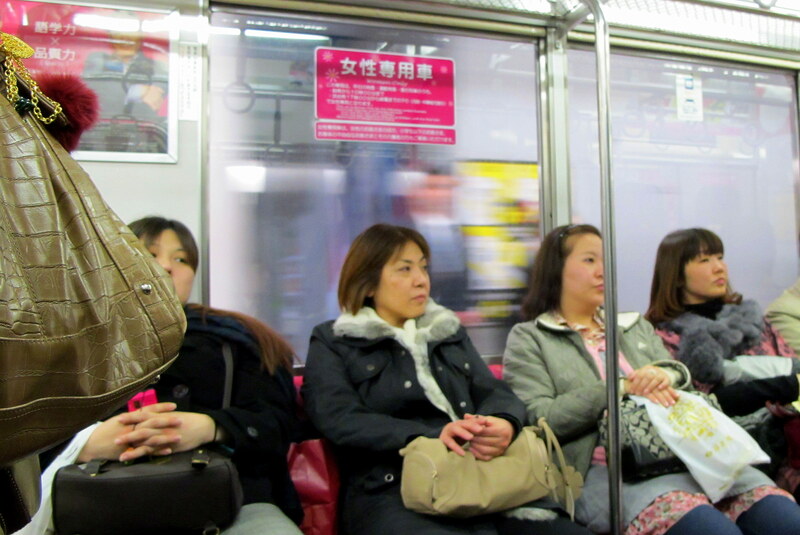 Japanese trains are famous all over the world for some features: punctuality, cleanliness and quietness. Talking on a cell phone is explicitly forbidden. Speaking loudly is frowned upon. Try to avoid this kind of behavior if you do not want to annoy other passengers. On shinkansen, in all trains in Tokyo, in other large cities, and in general in popular tourist lines, the speakers make announcements in Japanese and English. Sometimes also in Chinese and Korean. In the Nagoya region even in Portuguese! 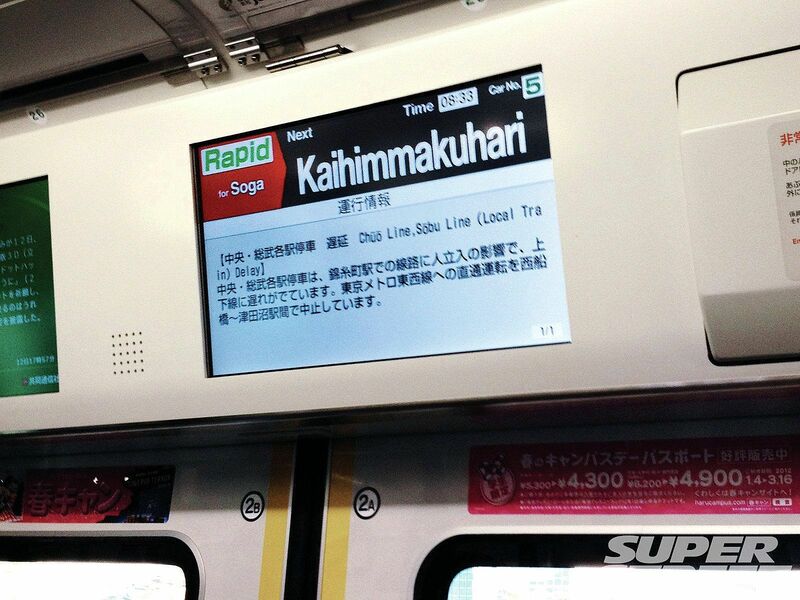 Many trains are also equipped with screens giving all the necessary information. If you really can't understand the announcements and there are no screens, try to look out the window, usually all the stations have signs with their name written in kanji, hiragana and the Latin alphabet. The previous and next stations are also usually indicated, as seen in the photo below. If you are really lost, just ask someone. Before you can get out of the station, you have to go through the turnstiles again. If you have a prepaid card, you will need to pass it near the reader. If you have a paper ticket, you need to insert it in the proper slot. This time the paper ticket will not be returned, so insert it and go. It could happen that you do not have enough money in the prepaid card for the route you have traveled, or you have entered a ticket not valid for that route. 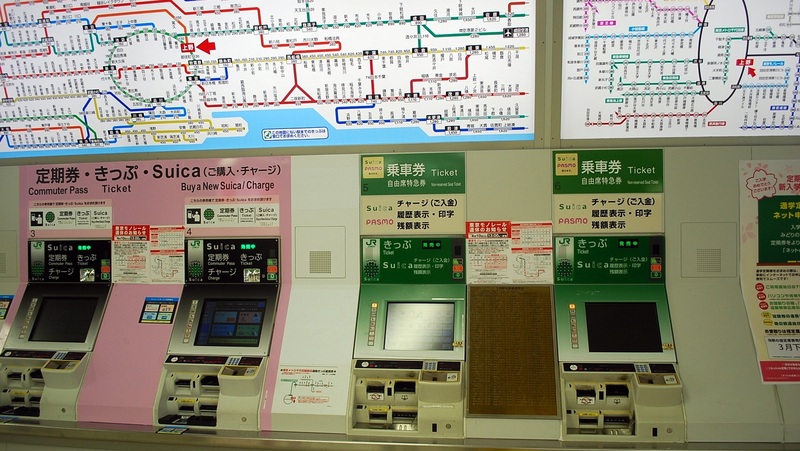 For example, you have purchased a 340-yen ticket, when your route actually costs 400 yen. 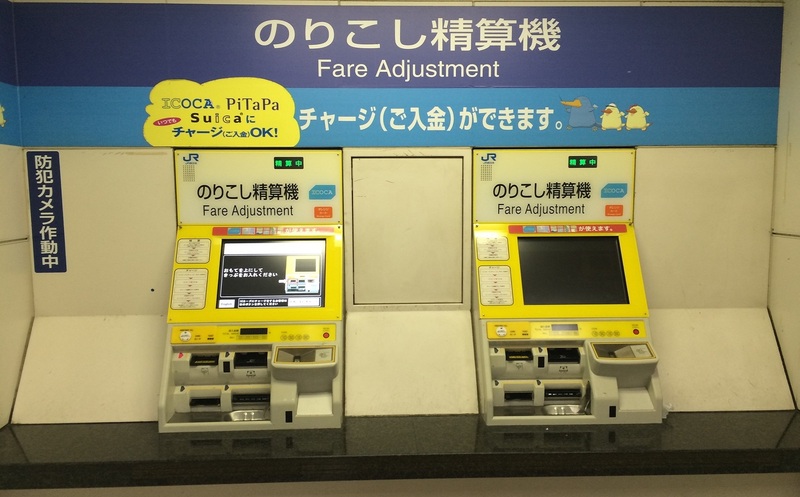 In these cases, before going through the turnstiles, you can use specific automatic machines (called fare-adjustment machine, picture below) where to top up your card or "adjust" the fare of your ticket by paying the missing amount. 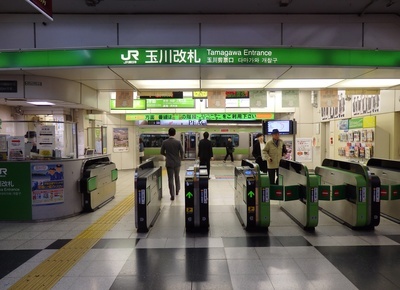 Many important stations in the big cities of Japan, and in particular in Tokyo, have several exit turnstiles from the departure platform area, and then even more numerous actual exits from the station building. If your destination is one of these huge stations (such as Shinjuku, Shinagawa, Tokyo station, Ikebukuro in Tokyo, or Namba in Osaka), it is advisable to try to understand which is the nearest exit to the place you want to go. You can always find several detailled maps of the station and its exit gates in any of these big station. If, on the other hand, you leave the station following the signs for the first "Exit" that you see once you get off the train (at random), you could end up somewhere opposite where you wanted to go, and then lose a lot of time to find the way.